The thing about this recipe that has always amazed me is the lack of leavening. I think you just kind of beat the fluffiness in. They are so moist, and so chocolatey – perfect brownies recipe. Melt butter and chocolate over low heat, stirring constantly. Cool slightly. Beat sugar, eggs, and vanilla on high speed in your mixer for 5 minutes. Turn to low speed and beat in chocolate mixture. Beat in flour until just blended. Stir in nuts. Spread into greased pan. Bake at 350° degrees F until brownies begin to pull away from sides of pan – 40 to 45 minutes. For true decadence, frost with Chocolate Buttercream Frosting. Hey Hallee.. I don’t have any unsweet chocolate.. but I do have a huge bag of semi-sweet chips.. could I use those instead? Would I need to adjust the sugar? Do you have unsweetened cocoa powder? You can use that – and I have often. 3TBS cocoa powder and 1 TBS oil for every ounce of chocolate. I would do it with semi-sweet chocolate chips. I would probably cut the sugar down to 1 cup to 1 1/4 cup of a cup. I’d be afraid to cut it any more because of the consistency of the dough. I think I will try the chips and use less sugar like you suggested. The coca powder is not unsweetened either.. I need to restock my baking section soon! I thinkI will make these in a little while, so I will let you know how it turns out!! Thanks Hallee!! And BTW, I am soo happy that your family will be one again in just a few more days!!! I adjusted my comment – I’d said 1 cup to 1/4 cup, but it should have been to 1 1/4 cup. Still good without the nuts, do you think? We are nut free around here (I’m allergic). 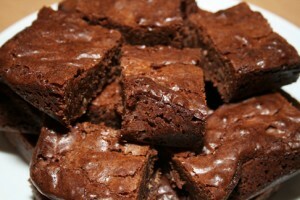 I LOOOOVE brownies and I am always interested in trying a new recipe. I make Martha Stewarts often. Yep! Kaylee doesn’t like nuts in cookies or brownies, so half the time, I leave them out. they sound delicious! thanks so much for sharing! I work here with Gregg and was the one who asked for the brownies a couple of weeks ago. Just wanted you to know I really enjoyed them and look forward to more. :) Thank you. I have a batch of these in the oven. I made a double batch because I know they are going to be a hit!!! I made them with 1 c white flour and 1 c ww flour. I am sure Scott won’t notice and then I can tell him they are ww! Hoping he will see how great ww can be!! My brownies didn’t last long! They were very good. I used half white flour and half whole wheat and used the semi sweet chips as that is what I had on hand. Thanks for the recipe I will certainly be making this more often! I found your blog via a web search for fresh milled flour brownies…which led me here! Did you soak all your flour, or just go at it as normal? I want to make these for my DH’s birthday this weekend. i look forward to looking through your site more — I see lots of good things! Hi. Welcome! I did not soak the flour for these – I just use it fresh out of the mill. I do soak for our breads and biscuits, but so far haven’t soaked for desserts. My husband had some of your brownies today and called to have me check out your page. I guess I’ll be making these sometime soon, and I will definitely be bookmarking your blog. Thanks! We made the brownies this morning. Yum! We have a mess of soft white berries. Between this and the blueberry muffin recipe, we should be able to use a little of it up. I am new to baking with fresh milled flour and am very excited to try this recipe. But, I am concerned about using 3 eggs since we have some egg sensitivity in my house. 1 is great, 2 ok, 3…too much. Can you advise on any adjustments to keep them yummy with less eggs? If you have access to flax seed, you can substitute 1 TBS ground flax seed and 3 TBS water for one egg. I’d go ahead and include it in the long beating period — there is no leavening in this recipe. The beating of the eggs for 5 minutes provides that.